Who are those children dressed in pink and blue? I do not recognize their wardrobes. They are sooo cute! Isn't that just the most fun thing to do with toddlers (look for cloud shapes)? 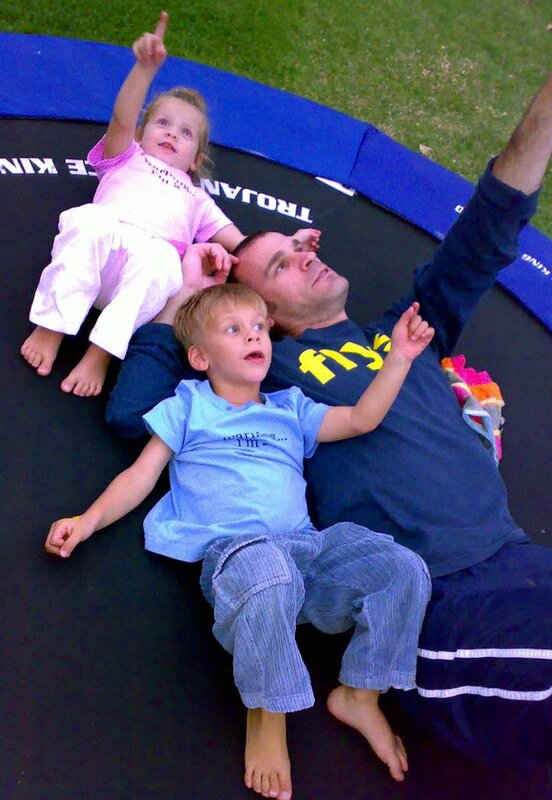 And those are just the best trampolines. My 4yr old son has one and loves it! p.s. doesn't your heart melt to see your husband like that? What an awesome picture and moment! look! it's spiderman in that tree! oh, no, wait...its mummy....typing away on her laptop and talking into her phone....in her mobile treehouse! I am delurking to finally comment on how gorgeous your family is! I can't believe how big they have gotten (yes, I've been lurking for about 4 years now...sheesh). You are one damn lucky woman. Gorgeous picture. I love snapping tender moments like that of my crew.